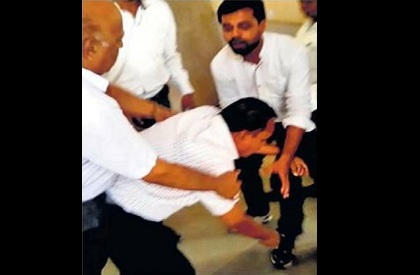 BHOPAL: In a shocking incident, a professor had to touch the feet of ABVP workers after they misbehaved with him and threatened to book him in a case. This incident occurred in the Government PG College in Mandsaur in Madhya Pradesh. Professor Dinesh Gupta tried to stop ABVP office-bearers when they were raising slogans in front of the class room. This upset them so much that they allegedly threatened him, termed him 'anti-national', and warned that a case would be registered against him. Scared, the professor then apologised and touched the feet of all the ABVP office-bearers. A video of the entire incident has gone viral in Madhya Pradesh. Even the principal had to come to the spot and raise slogans in support of ABVP workers. Talking to media persons, Prof Dinesh Gupta said that they were calling him 'deshdrohi' and wanted to register case against me. "These are not even students. They don't come to classes either, rather, they are involved in politics." "I want the students to study, move ahead. I am not going to file any case in this regard", he said. After the incident, there were diverse reaction among ABVP office-bearers too. A senior ABVP functionary said that it was his (Gupta's) fault to stop the office-bearers when they were raising slogans. He even went on to say that the professor was 'disturbed (mentally)' and hence touched everyone's feet. However, another senior functionary regretted the incident. In Madhya Pradesh, there have been several such incidents when ABVP office-bearers have attacked or humiliated teachers. Professor Sabharwal was killed after an assault in Ujjain a few years ago.